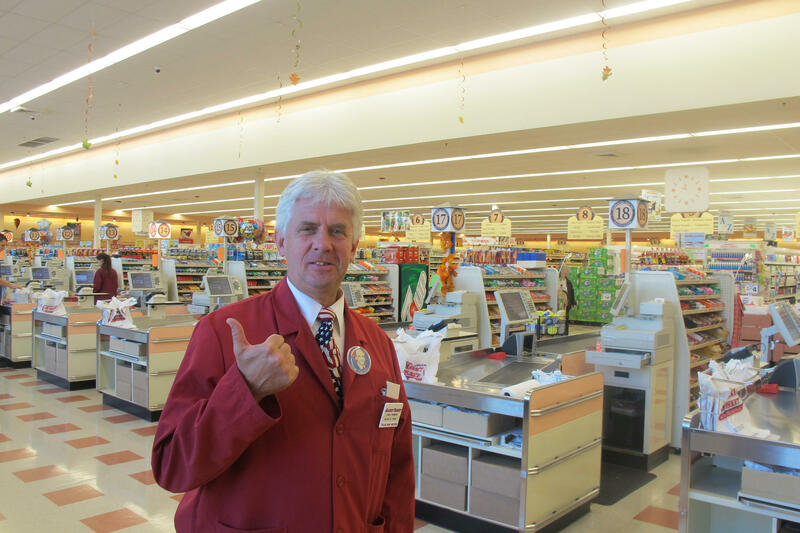 Biddeford Market Basket store manager Micum McIntire gives a thumbs up to the deal that ended the ongoing supermarket feud. Tom Porter reports on the reaction of workers at the Biddeford Market Basket to a deal ending the grocery chain's ongoing feud. BIDDEFORD, Maine - "There's very little that I could ever add to your brilliant work, your extraordinary display of loyalty and the power of your enduring, doing spirit over the past six weeks." Those words, spoken Thursday morning by re-instated Market Basket boss Arthur T. Demoulas, were music to the ears of hundreds of supermarket workers in Maine, and thousands more throughout the region. News that Arthur T. had struck a late-night deal with his cousin and business rival, Arthur S. Demoulas, to take control of the embattled New England grocery chain transformed the mood at Market Basket's only Maine outlet, in Biddeford, which opened 12 months ago. Store manager Micum McIntire sums it up: "Ecstatic, fantastic." As customers arrived Thursday morning, they were personally greeted, and thanked for their support over the last six weeks. Many shoppers boycotted the chain in solidarity with Arthur T., ousted as CEO two months ago, as a decades-old family feud erupted into in a boardroom revolt. This in turn led to a concerted wave of action by employees in support of Arthur T - action which led to bare shelves as the company's warehouse workers refused to make deliveries. But by Thursday morning, both the parking lot and the store shelves were filling up. McIntire hopes to have the store back to full capacity in the coming days. 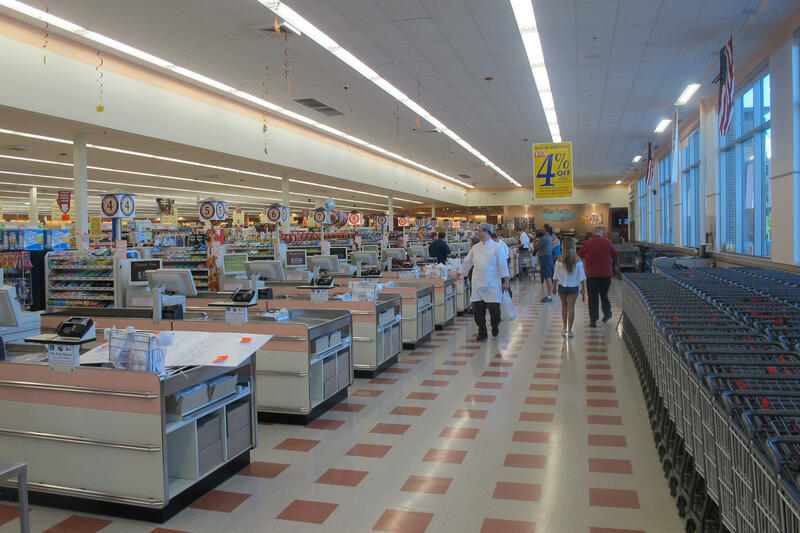 The Market Basket store in Biddeford starts coming back to life. "Well, it's going to take a little bit to get some produce - I mean the trucks are coming all the way from California," he says. "We will be getting produce in a small amount. But I got a fish delivery coming today, we got some meat down there, and everything else is pretty much - I some eggs, I got milk, so we got the basics here." Arthur T. Demoulas - or ATD - gained a loyal following among his employees for his personable management style and his profit-sharing commitment. Mike Menard is pleased he's coming back. "We're up and running, everybody's back, welcome back ATD." Menard is front-end manager, and happy to be busy for change. One of his tasks is to reach out to some of the company's 270 part-time workers - many of whom had been laid off for weeks - and offer them work. "Mike from Market Basket giving you a call," he says on one call. "We're up and running and want to know if you want to work today. Please give me a call back..."
"It's been kind of hard, seeing our customers not coming in and not getting the hours," says cashier Nancy Wedge, who is among the part-time employees relieved to be getting regular work again. "It's exciting to be back, seeing familiar faces coming in this morning. It's been great." Local resident Sabine McElrath came in earlier in the morning to celebrate with employees. Now she's stocking up on groceries. "I'm filling my cart with things I've missed from Market Basket over the last six weeks, like these crispy walnut praline cookies," she says. "But also. I will fill these shopping bags and bring it to a local food pantry just to support Market Basket and give them some revenue right away." "It was certainly a great victory for the employees and also the customers who have been holding out for so long," says Emily Porschitz, a business management professor at Keene State College in New Hampshire. The Market Basket store in Biddeford is once again open for business. Porschitz says Arthur T. Demoulas faces a tough challenge. The $1.5 billion deal enabling him to take over the 50.5 percent of Market Basket that he did not own, involves taking on new debt and a private equity partner. In addition, the chain, known for its low prices, is estimated to have lost tens of millions dollars in revenue during the six-week standoff. "He does have a long road back to recovery," Porschitz says. "You know, there have been some reports that suggest it's going to be difficult to keep the prices as low as they were before, and to pay employees the bonuses they were accustomed to, but it seems like employees are kind of OK with that, with knowing that they may have to sacrifice a little bit longer." Biddeford store manager Micum McIntire says he and his staff are relishing that challenge. "It's going to be amazing what we can do, and we're going to turn it around and we're going to be even stronger than before," he says. "I think cusomters are going to come in that have never shopped with us before just to see what it's all about." 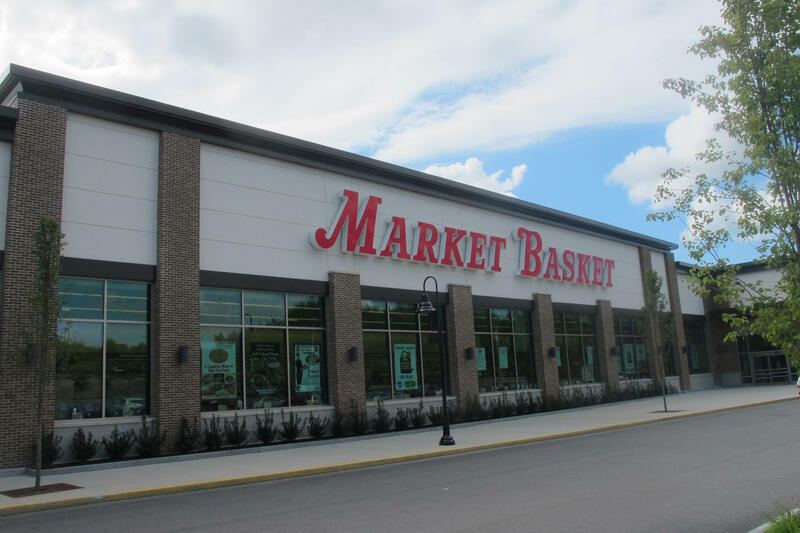 Market Basket employs some 25,000 people in 71 stores in Massachusetts, New Hampshire and Maine. BOSTON — Three independent Market Basket board members are again calling on the supermarket chain's protesting employees to return to work, and customers to return. The directors also say they are available to negotiate an end to a battle over control of the company. Last week, they said they had proposed fired CEO Arthur T. Demoulas and his management team return to help operations get back to normal without taking control of the company as talks continue on his bid to buy out family members. TEWKSBURY, Mass. — Thousands of employees, customers and politicians have rallied here in support of fired Market Basket CEO Arthur T. Demoulas. The crowd, estimated as high as 12,000, jammed a Market Basket parking lot off Interstate 495. They were there to condemn the company's board of directors for refusing to consider rehiring Demoulas and his management team. Tom Gordon, of Methuen, Massachusetts, one of the fired employees, said that keeping the pressure on through rallies and customer boycotts should eventually change the board's tack.